HOW DO I BOOK A PROGRAM FOR MY CLASS? Bookings can be made by phone or requested with our online form. Please let us know the best time of day to reach you, such as recess, lunch time or end of school day. WHERE CAN I FIND PROGRAM OPTIONS FOR MY CLASS? 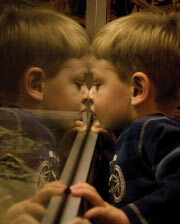 Our annual school programs guide lists programs based on grade level, and provides descriptions, duration, and pricing. It is available online here. WHAT IS THE COST FOR THE TEACHER & VOLUNTEER SUPERVISORS? If you have a specific date in mind, the sooner the better. For self-guided programs, we request at least 5 business days notice and guided programs, 2 weeks’ notice. WHAT TIME DO PROGRAMS OCCUR? 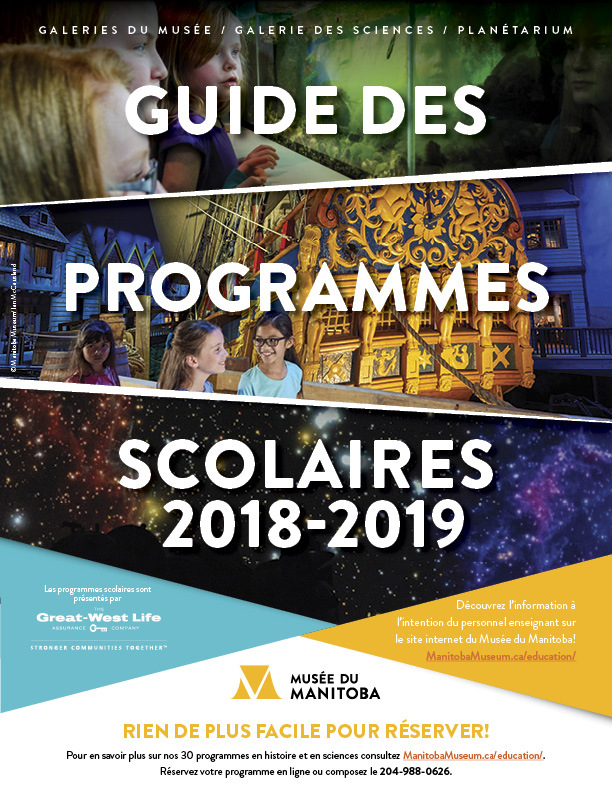 Most programs at The Manitoba Museum have flexible booking times. The majority of school programs occur between 10:00 and 2:00. We can accommodate earlier or later start times upon request. Please keep in mind the time your group could arrive vs the time you can start a program. It is recommended to arrive at least 10-15 minutes early to hang up coats, put away lunches and check in at the box office. It is also handy to know typical pick up and drop off times of your school division buses. Most programs are 1 hour long. Workshops are 1hour30 minutes to 1hour 45minutes long. Science Gallery demonstrations run 1hr 30 minutes (30 minute demonstration and 1 hour Science Gallery Explore time) Planetarium shows run, on average, 45 minutes. Groups self- guiding in the Science Gallery have a 60 minute time limit. Groups self-guiding in the Museum Galleries do not have a time limit but the average visit is from 1 to 2 hours. WHERE CAN THE SCHOOL BUS PARK? School buses are allowed to park along the Museum building on Rupert Street past our entrance in the loading zone area. DO I HAVE TO MAKE A BOOKING IF WE ARE SELF GUIDING IN THE GALLERIES? Yes! In order to receive the school discount rate, your group must be pre-booked or regular public rates will apply. No exceptions. HOW MANY STUDENTS/CLASSES/GRADES CAN I BRING AT ONE TIME? This will depend on the programs or areas you would like to visit. 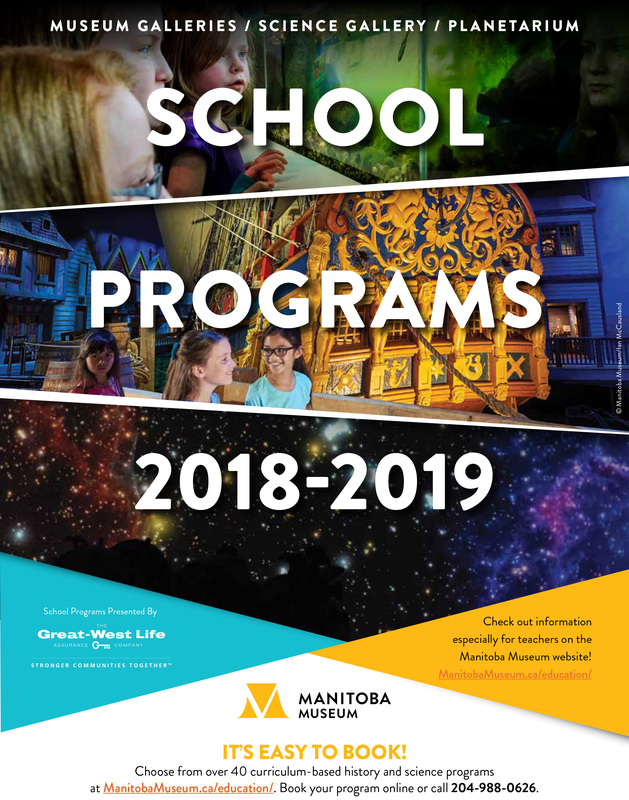 Please call the programs office at 204-988-0626 or email programs@manitobamuseum.ca for details. HOW DO I SCHEDULE A DAY OF PROGRAMS FOR MULTIPLE CLASSES? We do the scheduling for you! Once you provide us with your program request(s) and group details, we consult our bookings and offer the best possible schedule. HOW MUCH NOTICE DO I HAVE TO GIVE FOR CANCELLATION? We request 5 business days notice for cancellations. Less than 5 days notice will result in an administrative fee dependant on the booking. 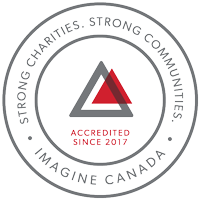 If any problems arise, please call the programs office at (204) 988-0626. WHY AREN’T BACKPACKS ALLOWED IN THE GALLERIES? Large bags and backpacks are not permitted in the exhibits or in our labs for security reasons. Many of the objects in the Museum are very fragile, old and irreplaceable. I HAVE NOT RECEIVED A CONFIRMATION LETTER. WHAT DO I DO? Confirmation letters are either faxed to the school or emailed directly to you depending on your request at the time of your booking. If you have requested a fax version and have not received the confirmation letter or have misplaced it, please call the programs office at 204-988-0626 and it will be resent. If you have requested an email version, please check you inbox & ‘junk’ folder. If it is not in either place, please call the program office at 204-988-0626 and it will be resent.